Aloo Methi (Potato and Fenugreek leaves) is the simplest, nutritious, and quick North Indian dish which goes very well with chapati's and pulkas. Adding this fresh methi leaves gives a nice aroma and a unique flavor to the dish. 1. Heat 2 tsp oil in a kadai and add chopped onions to it. Fry they turn translucent. 2. Add diced Potatoes and slit green chillies. Pour some water , close the lid and cook till potatoes are 1/2 cooked. 3. Now add chopped methi leaves, Salt to taste, Haldi and jeera powder . Stir it and again close the lid. Add more water if needed. Cook till aloo and methi leaves gets neatly blended and cooked and water is all dried up. 4. 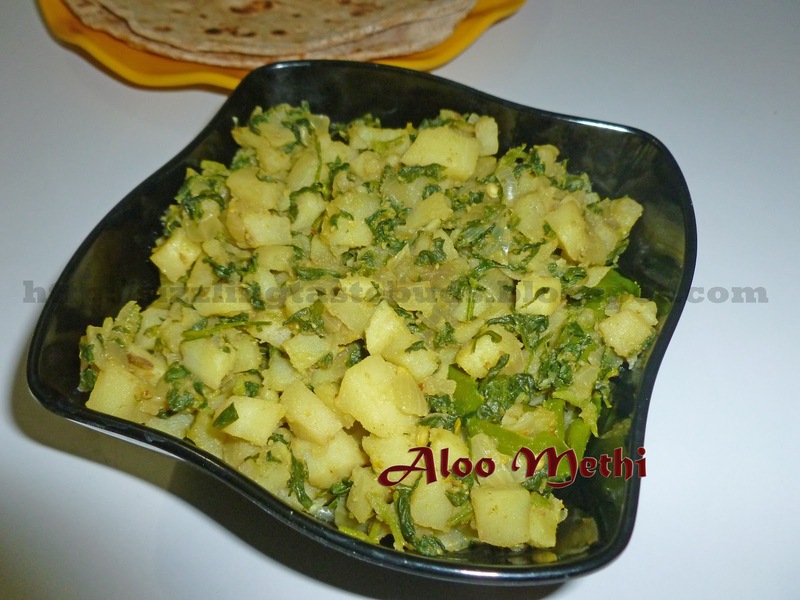 Enjoy this Healthy and tasty Aloo Methi with Hot Chapathi's or Pulka's.